A new piece came out yesterday on the Wellcome Trust Blog, strongly promoting approval of so-called “3-Parent IVF” or Mitochondrial Transfer technology by the UK Parliament. As I written in the past (here and here), my view is that this would be a mistake at this time. There is room for respectful disagreement on this issue between scientists, although I realize I’m up against some very prominent scientists including Drs. Peter Braude and Robin Lovell-Badge, whose past response to my open letter to the UK Parliament was one that I published on my blog here. I believe in presenting both sides and I respect Drs. Braude and Lovell-Badge greatly. 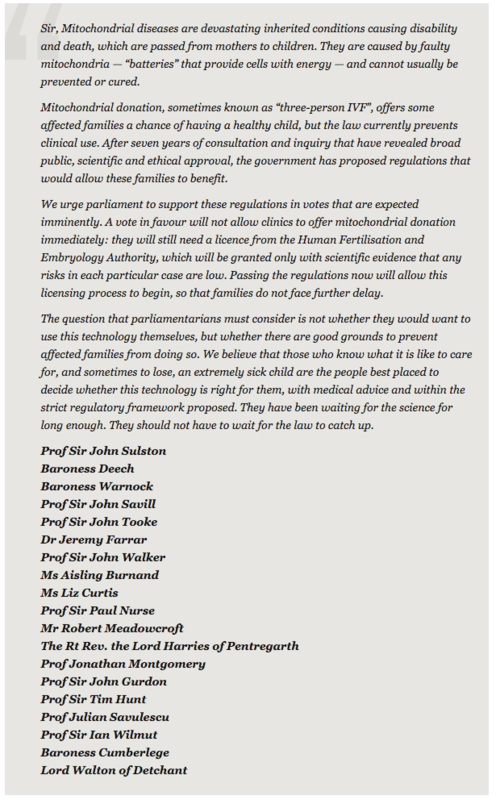 The new Wellcome Trust blog piece includes a letter signed by a host of additional top scientists and other prominent figures encouraging parliamentary approval of 3-parent technology (see the letter at the bottom of this post). This letter is signed by 5 Nobel Laureates and even some UK royalty. Do I really want to be on the other side from those folks too? Not really, but I need to call it like I see it and this is an important issue. I seem to be one of the few scientists including stem cell scientists who will publicly say that I believe we need to learn a lot more about this technology before it is used on humans. There is no doubt that mitochondrial diseases are truly terrible and need to be addressed, but if the potential outcomes from the technology are still vague, there are safety concerns, and it raises profound ethical issues such as changing the human genome heritably as is the case here, then my view is that a careful approach is both practical and logical. We cannot at this time have a reasonable expectation that this technology would be safe and effective. That may change in coming years with new knowledge. I hope so. As strange as it may sound, although mitochondria have been studied for around 150 years, they remain in many ways still a new frontier for science with many mysteries. We are only now, for example, starting to understand how the mitochondrial genome works. There was just recently a very unexpected discovery that the mitochondrial genome produces thousands of potentially powerful non-coding RNAs with largely unknown functions. Nobody has any clue how these RNAs might behave in the context of mitochondrial transfer. What else we will learn about mitochondria in coming years that is unexpected? I’d venture to say many mitochondrial surprises are still to come and there may well be things that we wish we knew in advance before we did human mitochondrial transfer. Science only has a very shallow depth of knowledge about mitochondria and new powerful genomics technologies are poised to change that quickly. I favor waiting until we learn more before we transfer mitochondria. Still, since there are so many big name folks on the other side including many I greatly respect, could I be wrong? Am I making a mistake publicly taking the other side? To be clear, I have no “iron in the fire” as the expression goes on this issue myself. I don’t work on this area of science or a competing area. It makes no practical difference to me whether the UK goes forward with mitochondrial transfer. If anything, my speaking out could be negative to me as I am taking what seems to be an unpopular, public stance. The UK House of Commons will debate this issue this coming Tuesday, February 3rd. Here’s the letter pushing for approval of this technology. My knowledge is very limited, so correct me if I’m wrong. 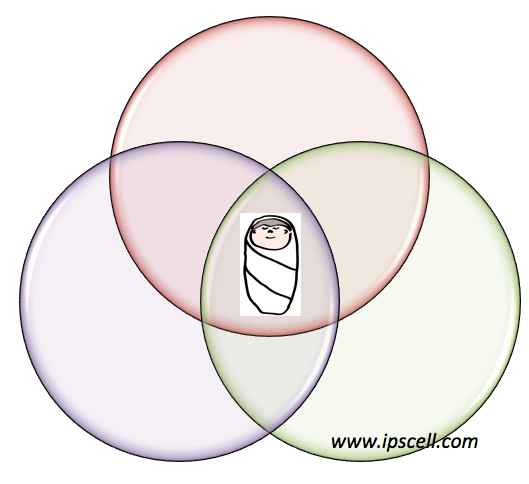 It seems that this “3-parent” technology is only envisioned for a small number of couples who have a well identified risk of conceiving children with severe disorders. There are existing technologies that most of these couples could use without the “3-parent” option. All of them have the option of not having children. So, if the “3-parent” technology gets the green light then perhaps it might remove some of the most problematic mtDNA from the human germline? But this would still leave less severe mitochodrial disorders. I guess that these less severe disorders would then become the severe disorders from the point of view of future generations? One might argue that, for the present generation, the British treatment would only be applied to a relatively small number of couples. A number than might be consistent with a decent clinical trial. Certainly the British seem determined to carefully follow the outcomes of their new-fangled “treatment”. If they were to call it a clinical trial, perhaps that might make you more happy? From what I have been able to find out, I’d be inclined to be supportive of the path that the British are taking — except for one thing. One thing slightly bugs me. The person being “treated” doesn’t exist. Basically, this “treatment” is about parent ego. But every nation on the planet saturated with far more harmful types of egomaniacal nonsense, so this cannot be a realistic objection. @Paul – you are ignoring the fact that any children produced by these couples without mitochondria from a second mother are going to die horrible devastating deaths anyway. Which is why every mother with damaged mitochondrial genomes is willing to participate in this currently experimental treatment. You seem to be worried that something could go horribly wrong. But something already has gone horribly wrong for these unfortunate mothers and any potential children. Surely in this context the calculus of weighing up risk and reward is a little different? I find the whole area unethical. The bill that my parliament has past is essentially license to conduct heritable genetic manipulation experiments on humans. The one thing that concerns me, and it’s something that is being overlooked, is this: it not a ‘cure’ for a particular set of diseases, rather these experiments will provide permanent germline modifications which will be passed down through the generations; it is the effects that theses experiments may have on future generations which are unknown.